Triptolide is a diterpene triepoxide from the Chinese medicinal plant Tripterygium wilfordii Hook F., with known anti-inflammatory, immunosuppressive and anti-cancer properties. Here we report the expression profile of immune signaling genes modulated by triptolide in LPS induced mouse macrophages. In an array study triptolide treatment modulated expression of 22.5% of one hundred and ninety five immune signaling genes that included Toll-like receptors (TLRs). TLRs elicit immune responses through their coupling with intracellular adaptor molecules, MyD88 and TRIF. Although it is known that triptolide inhibits NFκB activation and other signaling pathways downstream of TLRs, involvement of TLR cascade in triptolide activity was not reported. In this study, we show that triptolide suppresses expression of proinflammatory downstream effectors induced specifically by different TLR agonists. Also, the suppressive effect of triptolide on TLR-induced NFκB activation was observed when either MyD88 or TRIF was knocked out, confirming that both MyD88 and TRIF mediated NFκB activation may be inhibited by triptolide. 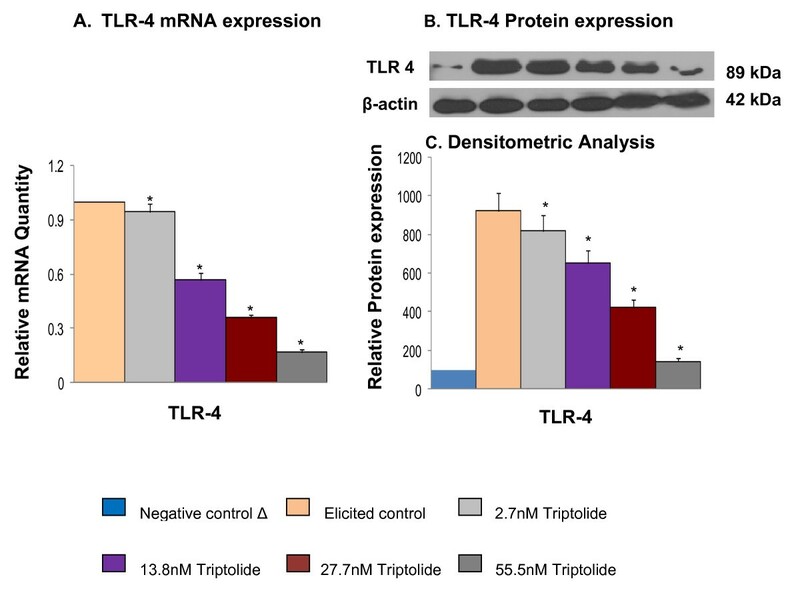 Within the TLR cascade triptolide downregulates TLR4 and TRIF proteins. 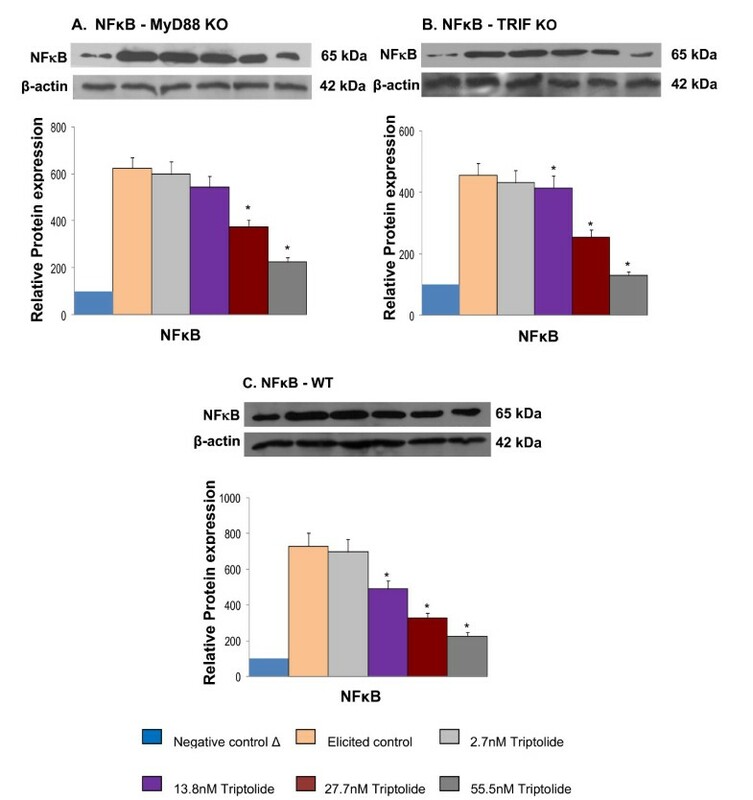 This study reveals involvement of TLR signaling in triptolide activity and further increases understanding of how triptolide activity may downregulate NFκB activation during inflammatory conditions. Chronic inflammation is an important patho-physiological condition impacting various diseases including rheumatoid arthritis (RA), atherosclerosis, diabetes, and cancer. Recent evidence suggests the involvement of Toll-like receptors (TLRs) in various chronic inflammatory and autoimmune diseases [1–3]. TLRs belong to the family of pathogen-associated molecular pattern recognition receptors and are vital components of the host's immune system for sensing dangerous pathogens, and for initiating inflammatory and immune responses directed against these pathogens. The mechanism of signal transduction through TLRs is well characterized [4–11]. There are two possible routes for mediation of signals received by TLRs depending on which of the two adapter molecules (MyD88 and TRIF) are involved. The importance of MyD88 and TRIF lies in the finding that each leads to a distinct profile of immune mediators that in turn determine the phenotype of the cells that are primarily responsible for the development of adaptive immune responses [1–4]. TLR4 mediates through both the MyD88 and TRIF pathways, TLR3 signals through TRIF and all the other TLRs mediate through MyD88 pathway [5–8]. Characterization of cellular responses to various ligands that selectively activate specific TLRs is not only useful in better understanding of disease pathogenesis but can also potentially help identify molecular targets by which pharmacological compounds modulate TLR-mediated signaling pathways and target gene expression. Triptolide is a biologically active diterpene triepoxide from a Chinese herb Tripterygium wilfordii Hook F, commonly known as thunder god vine. Extracts from this plant have been historically used in traditional Chinese medicine to treat inflammatory and autoimmune diseases such as rheumatoid arthritis, systemic lupus, psoriatic arthritis and Behcet's disease . Triptolide inhibited the expression of proinflammatory markers including COX-2 and iNOS in RAW macrophage . Triptolide suppressed c-jun NH2-terminal kinase (JNK) phosphorylation, COX-2 expression and PGE2 production in microglial cultures treated with lipopolysaccharide . NFκB activation due to inflammatory response in chronic diseases is well characterized . Existing reports demonstrate the effect of triptolide on NFκB activation and target gene expression as well as its effect on other transcription factors . Although TLRs are known to impact downstream NFκB activation , effects of triptolide in TLR signaling have not been evaluated. In this study we investigated the effects of triptolide activity on receptors and target gene expression induced by activation of TLRs. RAW 264.7 macrophage cells were cultured as described by Dey et al., 2006 . Briefly, cells were seeded at a density of 0.4 × 106cells per well (viable cell counts were carried out by trypan blue staining using a hemocytometer) in 24-well plates 12 h prior to treatment. The cells were then treated with triptolide dissolved in DMSO at concentration (per ml of cells) of 20 ng, 10 ng, 5 ng and 1 ng for 2 h before elicitation with bacterial endotoxin LPS (lipo-polysaccharide from E.coli, serotype 055:B5) at 1 μg/ml for TLR-4 elicitation, Zymosan at 1 ug/ml for TLR-2 elicitation and Poly I:C (synthetic analog of dsRNA) at 10 ug/ml for TLR-3 elicitation. The corresponding molar concentrations of triptolide (MW 360.4) that are used in Figures 1, 2, 3, 4 and 5 were 55.5 nM, 27.7 nM, 13.8 nM and 2.7 nM respectively. For each experiment, one positive control (cells treated with ligands and vehicle) and one negative control (cells treated with vehicle only) were included. For RNA extraction, the cells were harvested in TRIzol after 6 h of ligand stimulation and for protein expression the cells were harvested after 12 h. Two replicates were made for all the treatments and their controls. The concentrations of triptolide used were previously tested to be non-cytotoxic using a MTT assay . The CC50 (concentration at which 50% of cells remain viable) of triptolide for macrophages is ~83.2 nM. Pre-designed small interfering RNA (siRNA) oligonucleotides targeting endogenous MyD88 and TRIF were purchased from Ambion (Austin, TX). The siRNA duplexes were transfected using lipofectamine 2000 (Invitrogen) into RAW 264.7 cells following the manufacturer's protocol. Briefly, cells were plated at 0.2 × 106 cell/well in a 24-well plate maintained in Dulbecco's modified Eagle's medium (DMEM) supplemented with 10% heat-inactivated fetal bovine serum. After 24 h, cells were treated with 1 μl of 50 μM MyD88-siRNA or TRIF-siRNA in a transfection mixture containing lipofectamine 2000 and incubated in 5% CO2, at 37°C. After 24 h of transfection the medium was changed with 1 ml of fresh DMEM. Two hours before elicitation with LPS (1 μg/mL), the cells were treated with predetermined doses of triptolide. For RNA extraction, the cells were harvested in TRIzol after 6 h of treatment and for protein expression the cells were harvested after 12 h.
Total RNA extraction, purification and cDNA synthesis were performed following procedures described in Dey et al., 2006 .
qRT-PCR was performed as described by Dey et al., 2006 . Gene-specific primers (synthesized by IDT Inc., Coralville, IA) used in the current study are described in Table 1. For the gene array experiment, PCR-arrays (APM_025, SABiosciences, MD) were purchased and the manufacturer's protocol was followed. Relative quantification based on SYBR green was used for individual and gene array experiments. Sequence of primers used for real time RT-PCR. The cells were lysed using RIPA buffer (Pierce, Rockford, IL) according to the manufacturer's protocol. Equal amounts of total cellular protein (20 μg) was quantified using BCA protein assay kit according to the kit's protocol. The samples were resolved by 10% SDS-PAGE under reducing conditions (100 V, 2 h) and transferred to nitrocellulose membranes (50 V, 2 h) in a buffer consisting of 20% v/v methanol, 200 mM Glycine, 25 mM Tris, pH 8.3. The membrane was blocked for overnight at 4°C and then incubated with anti-TRIF rabbit polyclonal antibody (1:1000) or anti-TLR4 rabbit polyclonal antibody (1:1000) or anti-actin rabbit polyclonal antibody (1:5000) for 2 h at RT. Horseradish peroxidase-conjugated secondary anti-rabbit antibody was used and incubated for 1 h at RT. Immunodetection was performed using an ECL Advanced Western blotting detection Kit chemiluminescence system. The autoradiograms were quantified using scanning densitometry (Total Labs software v 2.01). Nuclear extracts were prepared according to the instructions provided in NE-PER™ Pierce Nuclear and Cytoplasmic extraction kit). Cells were collected 45 minutes after LPS induction (1 μg/ml). A 50 μg amount of nuclear extracts from macrophage cells were electrophoresed in 12% SDS-PAGE under reducing conditions, transferred to nitrocellulose membranes and blocked with 5% Non-fat milk powder in PBS. Membranes were incubated with rabbit polyclonal antibodies to p65 (1/500) or anti-actin. Secondary anti-rabbit peroxidase bound antibody was used. The immunodetection was performed using an ECL Advanced western blotting detection Kit chemiluminescence system. The autoradiograms were quantified using scanning densitometry (Total Labs software v 2.01). The data are expressed as Mean ± Standard Deviation (SD). Statistical significance for the data for mRNA and densitometric analysis were calculated using analysis of variance (ANOVA) and the group means were compared by the least significant difference test (LSD). The results were considered statistically significant if p < 0.05. Expression of one hundred and ninety five target genes in response to triptolide treatment were studied by gene array in LPS stimulated mouse macrophages. The genes based on their response to LPS stimulation were characterized as LPS-responsive (Table 2) and LPS-nonresponsive genes (Table 3). Among LPS-responsive genes, 42 genes were downregulated (Table 2a) and 2 genes (Table 2b) were upregulated by triptolide treatment. Fourteen genes were found to be non-responsive to LPS induction (Table 3). Of these non-responsive genes, 8 genes were downregulated (Table 3a) and 6 genes were upregulated by triptolide treatment (Table 3b). Huang et al. (2006) reported that 320 genes were upregulated in RAW 264.7 cells in response to LPS treatment but only 32 (10%) genes were downregulated by triptolide . In our study that included some overlapping genes with Huang et al (2006) , triptolide down regulated 21% of the LPS-induced genes and affected a total of 22.5% of LPS-responsive genes (including down and upregulations) in RAW macrophages. Triptolide treatment was found to downregulate the expression of TLRs 1 and 4 (Table 2a), TLRs 3 and 7 (Table 3a), TNF, IL-6, IL-1, NFκB1, MAPK, Rel, Bcl3, COX-2 (Table 2a) and other important inflammation regulating genes (Tables 2, 3, 4). 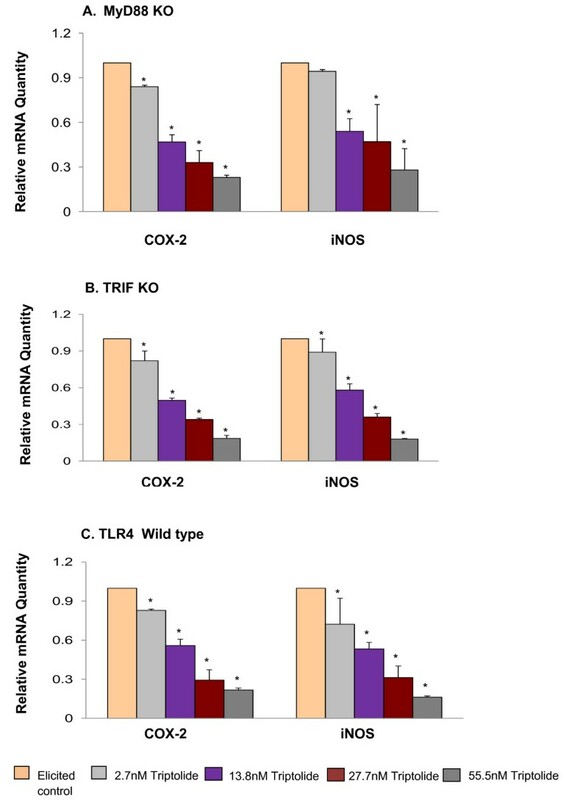 The gene array results obtained for COX-2, TNFα, IL1β (data not shown) and TLR4 were further validated using qRT-PCR. We further investigated expression of TLR-mediated genes to understand in greater details the extent of involvement of TLR signaling cascade in the activity of triptolide. Fold changes in gene expression in cells treated with triptolide (55.5 nM)+LPS (1 μg/ml) as compared to those treated with LPS (1 μg/ml) alone. a) Downregulation of LPS- stimulated genes by triptolide. b) Upregulation of LPS down regulated genes by triptolide. Positive values (≥+3) indicate stimulation while negative values (≤-3) represent suppression of gene expression. Fold changes in gene expression in cells treated with triptolide (55.5 nM) as compared to endogenous expression levels in untreated cells. a) Downregulation (≤-3) of LPS-non responsive genes by triptolide. b) Upregulation (≥+3) of LPS-non responsive genes by triptolide. LPS (1 μg/ml) did not have any effect on these genes. Fold changes in gene expression in cells treated with LPS (1 μg/ml) as compared to endogenous expression levels in untreated cells. Triptolide (55.5 nM) did not have any effect on these genes. There are three possible routes through which TLR signaling is mediated [5–8]. These routes either involve the adapter molecule MyD88, TRIF or both. TLR3 signals through TRIF and all other TLRs mediate through MyD88 pathway whereas TLR4 utilizes both MyD88 and TRIF to transduce the signal it receives [5–8]. One of the important readouts of TLR ligand induction is a robust pro-inflammatory response such as an upregulated expression/secretion of chemokines and cytokines. Using this modulation of chemokines/cytokine expression during different ligand induction the response to triptolide treatment was evaluated. Triptolide inhibited the expression of COX-2 and iNOS induced by MyD88- specific ligand - Zymosan (TLR2), TRIF- specific ligand, Poly I:C (TLR3) and LPS (TLR4) which activates both MyD88 and TRIF pathways (Figure 1). Downregulation of COX-2 and iNOS by triptolide  along with selected cytokines/chemokines that are specific to each route of TLR signaling have been used to validate downstream effects of triptolide along the TLR pathway. COX-2 and iNOS expression is common to both MyD88-dependent and -independent (TRIF) signaling pathways. The expression of CCL3 is specific for MyD88-dependent pathway and expression of IRG-1 is a specific readout of the TRIF-dependent pathway [20–22]. Triptolide inhibited the expression of CCL3 in macrophage induced with Zymosan (MyD88 specific ligand) and LPS (TLR4 specific but utilizes both TRIF and MyD88) (Figure 1A and Figure 1C). Triptolide also inhibited the expression of IRG-1 in macrophages induced with Poly I:C (TRIF specific ligand) and LPS (Figure 1B and Figure 1C). These results demonstrate that triptolide inhibits the activation of chemokines involved in both MyD88 and TRIF dependent pathways. Effect of triptolide on gene expression of COX-2, iNOS and chemokines in response to various TLR ligand activation in RAW macrophages. The effect of triptolide treatment (three replicates) on a specific gene expression was measured by the mRNA quantity relative to the response to ligand activation only (positive control) that was normalized to a value of 1.00; lower values represent greater inhibitory effects with 0.00 corresponding to a complete inhibition of the induced gene expression. The value of the negative control (no induction) was normalized to 0.00. Values are mean ± S.D. *, p < 0.05; (post-ANOVA comparison with Ligand-treated positive control). A. Effect of triptolide on mRNA levels of COX-2, iNOS and CCL3 following zymosan stimulation. B. 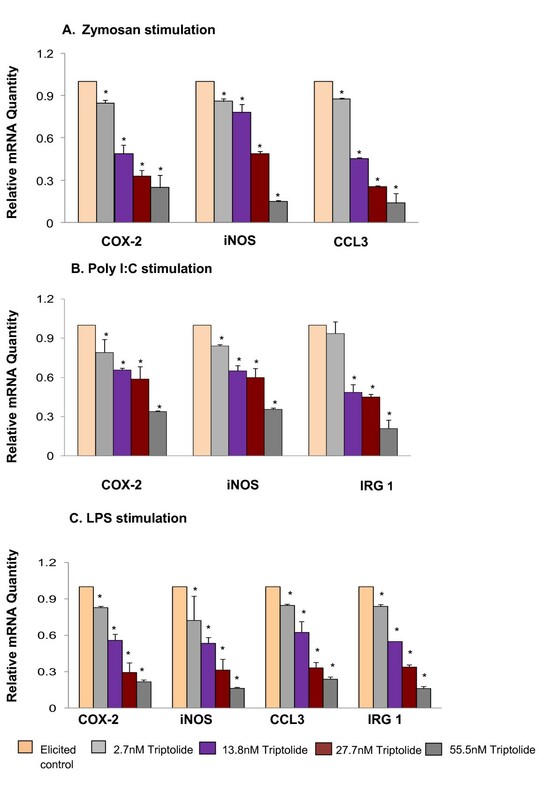 Effect of triptolide on mRNA levels of COX-2, iNOS, and IRG-1 following Poly I:C stimulation. C. Effect of triptolide on mRNA levels of COX-2, iNOS, CCL3 and IRG-1 following LPS stimulation. To further validate the effect of triptolide on inflammatory pathways of MyD88 and TRIF, we evaluated the effect of triptolide on LPS induced macrophage under the two following scenarios: (1) MyD88 mediated pathway in the absence of TRIF regulation and (2) TRIF mediated pathway in the absence of MyD88 regulation. As both MyD88 and TRIF signaling pathways lead to NFκB activation , we determined the activity of triptolide on NFκB translocation to the nucleus (Figure 2). Also, because COX-2 and iNOS are downstream target genes regulated by NFκB, their increased expression is an indirect indicator of NFκB activation. To further validate results of Figure 1, whether or not triptolide modulates both MyD88 and TRIF mediated signaling pathways, the activation of NFκB and the expression of COX-2 and iNOS induced by LPS in MYD88-KO macrophages and TRIF-KO macrophages were determined. Triptolide suppressed LPS-induced NFκB translocation in a dose dependent manner as determined by immunoblotting of the p65 protein in nuclear extracts. We observed that the incubation of MyD88-KO and TRIF-KO macrophages with LPS (1 μg/mL) produced an increase in NFκB translocation (p65 subunit) to the nuclear compartment that was evident at 45 mins of incubation time. Figure 2A, 2B and 2C show that this translocation process was inhibited in MyD88-KO, TRIF-KO and Wild-type macrophages by pretreatment with triptolide in a dose dependent manner. Similarly, triptolide inhibited the gene expression of COX-2 and iNOS induced by LPS in MyD88-KO, TRIF-KO and Wild-type macrophages in a dose dependent manner (Figure 3A, 3B and 3C). Together, these results demonstrate that triptolide suppresses both MyD88 and TRIF -dependent signaling pathways. Effect of triptolide on gene expression of COX-2 and iNOS (mean ± S.D). The expression of specific genes was measured by the mRNA quantity relative to the response to LPS activation (positive control) that was normalized to a value of 1.00; lower values represent greater inhibitory effects with 0.00 corresponding to a complete inhibition of the induced gene expression. The value of the negative control (no induction) was normalized to 0.00. A. Expression of COX-2 and iNOS genes in MyD88KO macrophages; B. Expression of COX-2 and iNOS genes in TRIFKO macrophages; C. Expression of COX-2 and iNOS genes in WT macrophages. * Significantly different from control (p < 0.05) ANOVA followed by LSD. Triptolide was found to suppress both MyD88 and TRIF-dependent signaling pathways activated by LPS agonization of TLR4. (Figures 2, 3). Therefore, to further characterize the role of triptolide in the signaling events triggered by LPS in macrophages upstream of NFκB, we studied the expression of adapter molecules TRIF and MyD88 as well as that of TLR4 receptor at mRNA and protein levels. 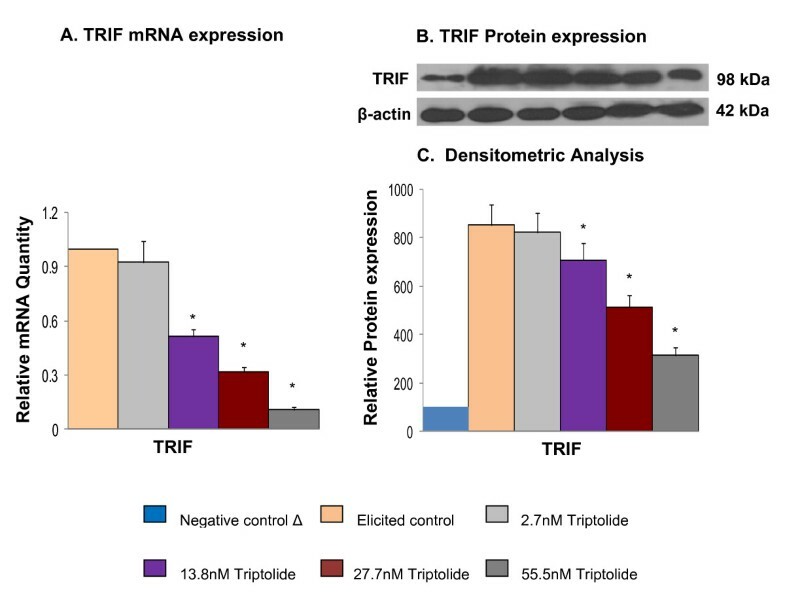 Triptolide treatment suppressed the mRNA and protein levels of LPS-induced TLR4 (Figure 5) and TRIF (Figure 4) expression but not MyD88 (data not shown). Suppression of poly I:C induced TLR3 mRNA expression by triptolide, the only TRIF specific toll-like receptor, has not been observed by qRT-PCR (data not shown). Together these observations suggest that triptolide inhibition of NFκB may be directed from the receptor level for MyD88 pathway and from the adapter level for TRIF pathway. Effect of triptolide on mRNA and protein expression of TRIF (mean ± S.D). The mRNA expression of TRIF was measured by the mRNA quantity relative to the response to LPS activation (positive control) that was normalized to a value of 1.00; lower values represent greater inhibitory effects with 0.00 corresponding to a complete inhibition of the induced gene expression. The value of negative control (no induction) was normalized to 0.00. A. mRNA expression of TRIF; B. Protein expression of TRIF; C. Densitometric analysis for protein expression. * Significantly different from control (p < 0.05) ANOVA followed by LSD. Past studies have demonstrated that triptolide can induce anti-inflammatory responses in several assay systems [14, 23]. However, the direct molecular targets of triptolide have remained elusive. In our previous report, we showed that triptolide significantly inhibited the secretion of inflammatory cytokines that occurred with RAW 264.7 cells when stimulated with LPS . Subsequently, we performed a gene array analysis (Tables 2, 3, 4) to elucidate additional members of the immune signaling cascade that could be potential targets of triptolide activity. The results of this analysis showed that 44 genes, which were known to regulate inflammation were differentially expressed in stimulated RAW 264.7 cells following triptolide treatment. These 44 genes represented key immune signaling pathways such as TLR signaling, MAPK signaling, Jak-STAT signaling and cytokine-cytokine receptor interaction. In our present study we undertook further investigation on cellular mechanism of triptolide activity that focused on TLRs, given their upstream location in the immune signaling cascade and their increasingly recognized importance in inflammatory and autoimmune diseases . LPS induces TLR4 dimerization to trigger the activation of downstream signaling pathways [25, 26]. This receptor dimerization activates transcription factor NFκB, leading to the induction of inflammatory gene products such as COX-2 and iNOS [25, 26]. Many studies have demonstrated that triptolide and its synthetic derivatives inhibited NFκB activation induced by TLR4 agonist LPS [13, 14, 27] but effect of triptolide on any TLR expression was never reported. The present study shows that triptolide suppressed ligand (LPS)-induced expression of TLR4 at mRNA and protein levels (Figure 5). We also observed for the first time that triptolide suppressed Poly(I:C) (TLR3 agonist) and Zymosan (TLR2 agonist) induced expression of COX-2 and iNOS (Figure 1A, B). These observations suggest that triptolide may offer protection against wide range of infections that occurs by different TLR inductions. The TLR-ligand activities are transduced through specific intracellular adaptor molecules, most notably MyD88 and TRIF. The importance of MyD88 and TRIF lies in finding that each leads to a distinct profile of immune mediators that in turn determines the phenotype of the cells that primarily are responsible for the development of adaptive immune responses [1–4]. By studying the expression of well-characterized cytokine/chemokine target genes downstream of MyD88 (e.g., CCL3) and TRIF (e.g., IRG-1) [21, 22] we demonstrated differential regulation exerted by triptolide in ligand-induced 264.7 RAW macrophages. We observed that triptolide downregulated the expression of both MyD88-dependent cytokine such as CCL3 induced by MyD88-dependent ligands (Zymosan/TLR2 ligand, LPS/TLR4) and TRIF-dependent cytokine IRG-1 (Poly I:C/TLR3 and LPS/TLR4) in a concentration dependent manner (Figure 1A, 1B and 1C). To further confirm that both MyD88 and TRIF mediated signaling are involved in triptolide activity, we showed that triptolide suppressed the NFκB translocation (p65 molecule) to the nucleus and also the downstream expression of COX-2 and iNOS mRNA in MyD88 KO (when only TRIF is present) and TRIF-KO (when only MyD88 is present) macrophages as well as in wild-type macrophages induced with TLR specific ligand, LPS (Figure 2 and 3). These results show that inhibition of NFκB activation and COX-2 and iNOS expression by triptolide could be achieved in presence of MyD88 or TRIF alone or when both are present as in wild type macrophages. These results also suggest that triptolide can block both MyD88- and TRIF-dependent pathways that lead to NFκB transactivation. Since MyD88 and TRIF are the only adapters exclusively mediating all TLR signaling, it is possible that triptolide may suppress wide-range of TLR signaling through other TLRs in addition to TLR4. Although in the current study we focused on TLR4 pathway, our gene array data (Tables 2a and 3a) as well as the observations presented in Figure 1A and 1B may support the suggestion that triptolide has activities against other TLRs. 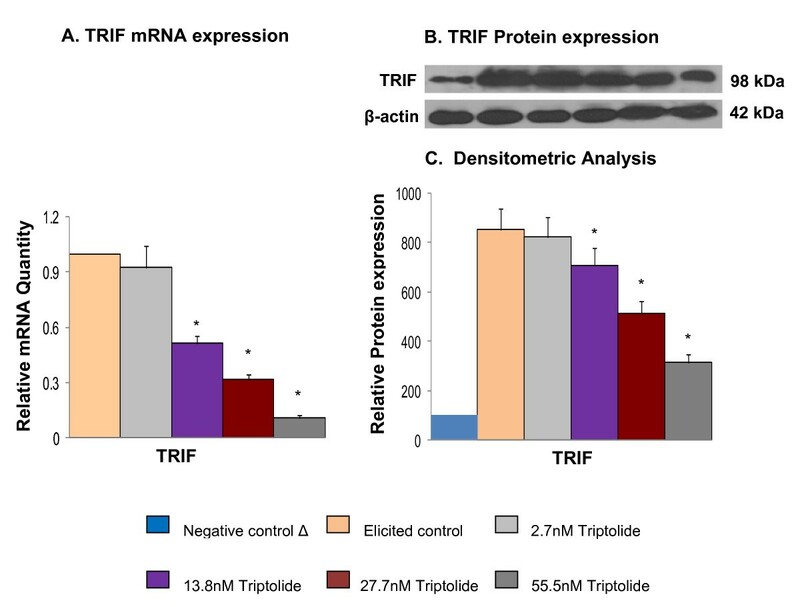 When the changes in the expression of TRIF and MyD88 in response to triptolide were tested (Figure 4), triptolide inhibited the mRNA and protein expression of TRIF, but not MyD88 in a dose dependent manner. A study by Yamamoto et al. (2003)  using TRIF knockout mice has revealed that TRIF is physiologically essential for TLR-3 mediated signaling and that TRIF is involved in the LPS-induced MyD88-independent pathway. Triptolide blocked early signaling pathways of TLRs suggesting that its inhibitory action was at the receptor and adapter molecule levels. Thus, a direct interaction of triptolide with TLR4 may be hypothesized. This study suggests that plant compounds, such as triptolide, can modulate TLR-mediated inflammatory responses and can reduce the risk of chronic diseases, associated with exaggerated TLR activation. Macrophages are the key antigen presenting cells in the pathogenesis of RA and involvement of TLR4 has been shown to play role in joint destruction in RA . Therefore, the present study showing interaction of triptolide with components of TLR signaling, such as TLR4, are particularly relevant and support the recent promise shown in clinics against RA by botanical extracts containing triptolide [30, 31]. The results from the present study suggest that the suppression of agonist-induced NFκB activation and chemokine expression by triptolide is mediated by targeting the early signaling of TLRs, particularly that of TLR4 in RAW 264.7 cells. Triptolide downregulated the expression of TLR4 proteins and that of TRIF adapter proteins in the MyD88-independent pathway of TLR4. In addition gene expression profiles in response to triptolide treatment in stimulated macrophages suggest that triptolide may have multiple cellular targets contributing to its strong anti-inflammatory and immune suppressive properties. MD, VGP and IR have a Ph.D in Biology or related fields as their highest obtained degree. RD has a M.S. in Horticulture and is currently studying towards her MBA. MD was formerly an Assistant Research Professor at the Biotechnology Center at Rutgers University, NJ and currently an Associate Professor in the Nutrigenomics Program, South Dakota state University, SD. MD specializes in Molecular Biology. VGP was formerly a Postdoctoral Associate at Rutgers University and is currently working as a Postdoctoral Researcher at University of Cincinnati, OH. RD is a Senior Laboratory Technician in IR's group at Rutgers University, NJ. IR is a Professor in the Department of Plant Biology and Pathology at Rutgers University, NJ. Vummidigiridhar Premkumar, Moul Dey contributed equally to this work. Chemokine (C-C motif) ligand 3. The authors would like to thank Reneta Pouleva for her excellent technical support. Funding for this work came from Phytomedics, Inc., Jamesburg, NJ to IR and by National Institute of Health (NIH) Pathway to Independence award [Grant K99AT004245 and 4R00AT004245] to MD. Additional funding sources are (to IR): NIH Center for Dietary Supplements Research on Botanicals and Metabolic Syndrome [Grant 1-P50 AT002776-01], NIH [Grant U01 TW006674] for ICBG. VGP and RD were supported in part or in full by the grants listed above. MD conceived of the study, designed all experiments, carried out, analyzed and interpreted gene array experiments and data. MD also wrote part of the manuscript. VGP carried out rest of the experiments, analyzed his part of data and helped with drafting the manuscript. VGP also interpreted his analyzed data in consultation with MD. RD participated in real-time PCR experiments and helped in proof reading the manuscript for English grammar. IR provided facilities within his laboratory for all experiments at Rutgers University. IR also provided critical comments on the manuscript. All authors read and approved the final manuscript.